Like their rivals, the Persian Safavids and Indian Moghuls, the Ottomans established an absolute monarchy that maintained power with a sophisticated bureaucracy influenced by the Mongol military state and a legal system based on Muslim law that relied on both military power and economic might to maintain control. One of their great challenges was to reconcile Islamic egalitarianism with their autocratic rule. The Ottomans were able to hold on to power as long as they did at least partly because they relied on outsiders to fill positions in the military and the bureaucracy. That way were able to maintain a healthy distance between themselves and the local people. Because they were connected to the local people, the military and the bureaucracy were more likely to remain loyal and under control of the Ottoman rulers. Under the Ottomans, a hierarchy stretched down from the sultan through governors down to the village or neighborhood headman. Ottoman Pashas were like English governors in India and Malaysia. They regarded their postings as living in exile among savages. Islam's holiest site Ottoman Turkey was an Islamic state. It was the seat of the Muslim caliphate and guardians of the Holy Islamic sites in Mecca, Medina and Jerusalem and the pilgrimage routes to the Hajj. The Turks viewed themselves as a defender of the Sunni Islamic world and culture against Christendom to the West and Shiite Islam to the east. Many of their military campaigns were organized under of the banner of jihad. 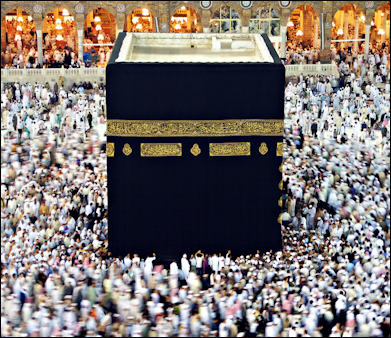 The Ottomans greatly improved the Grand Mosque around the Kaaba in Mecca. Every year they presided over the Hajj with great pomp and formality and organized a great pilgrimage caravan from Damascus to Mecca and used it as an opportunity to display their authority over the Muslim world and their proficiency in maintaining the Holy Sites. The Ottomans were relatively devout but Islam was not an underpinning of their authority as it had been in Arab-Muslim dynasties that owed their legitimacy to their relationship to the Prophet. The religious elite was of mixed origin and trained at religious schools in Istanbul in a manner similar to the Janissaries. The most powerful were the muftis, who advised the sultan on religious matters. But overall religious people didn’t have much power. The sultans governed according to the Koran and sharia (Islamic law) and civil codes that dealt with criminal and financial matters. Even so the sultan had the right to issue fermans, or edicts, on subjects not covered by Koran. These laws in turn influenced the laws of other nations. Suleyman the Magnificent, also know as Suleyman “lawgiver,” streamlined the Ottoman legal system. The Ottomans helped develop the system of Islamic courts and define sharia as it could be applied in a formal setting. Under the millet system, Christians were tried under their own laws. Judges were appointed and paid by the government. They and the legal personnel that supported them were organized like the local Ottoman bureaucracy. Judges not only presided over cases they settled disputes and oversaw financial transactions and sometimes acted as spokesmen for the sultan. Ottoman power was administered with “bureaucratic efficiency, unrivaled by an state at that time.” The empire was essentially a bureaucratic state with different regions under the umbrella of single administrative and economic system. The administrative elite was drawn mainly from converts to Islam from the Balkans and Caucasus that were slaves in the sultan’s household and were recruited and trained like Janissaries. This was to make sure that their loyalty was with sultan not the local people. Local people were encouraged to participate in the government but they were generally not given positions with much power. At the top of Ottoman bureaucracy was the grand vizir, an official who answered only to the sultan and was often the real power behind the throne. Below him were other vizers that controlled the military, the civil service and the regional governments. The highest officials made up a council that met in the sultan’s palace and decided policy, met foreign ambassadors and responded to petitions. Sometimes the sultan showed up at these meetings but mostly they were presided over by the grand vizer. Low level bureaucrats consisted primarily of secretaries who drew up documents and officials who kept financial records (most of which still exist and are carefully filed away). Subjects were expected to comply with their orders and requests. If not security forces were called in. “Those who receive the highest offices from the Sultan are for the most part the sons of shepherds or herdsmen, and so far from being ashamed of their parentage, they actually glory in it, and consider it a matter of boasting that they owe nothing to the accident of birth; for they do not believe that high qualities are either natural or hereditary, nor do they think that they can be handed down from father to son, but that they are partly the gift of' God, and partly the result of good training, great industry, and unwearied zeal; arguing that high qualities do not descend from a father to his son or heir, any more than a talent for music, mathematics, or the like; and that the mind does not derive its origin from the father, so that the son should necessarily be like the father in character, our emanates from heaven, and is thence infused into the human body. Among the Turks, therefore, honours, high posts, and judgeships are the rewards of great ability and good service. If a man be dishonest, or lazy, or careless, he remains at the bottom of the ladder, an object of contempt; for such qualities there are no honours in Turkey! The provincial governments were organized like hierarchal corporations with successively smaller divisions, departments, and branches. The governors had their own bureaucracy which was like a miniature version of the state government. Within large provinces there were regional governments (equivalent of country governments). that in turn had their own bureaucracies. The primary duty of these governments was to collect taxes. There were taxes on the import and export of goods, on urban trades and crafts and on agricultural production. Non-Muslims paid a poll tax graded according to wealth. Muslims paid no personal taxes. They often made Islamic zakat payments. This money supported religious schools and social services. In the cities there were police, other security forces, firefighters, street cleaners and lamplighters. Religious foundations and charities supported by Muslim zakat payments ran and maintained schools, hospitals, hostels and mosques. Because was little threat of attacks, city walls were pulled down or fell into disuse. The Ottomans ruled using the iqta system, a method of dividing land and paying tributes and taxes that was devised by the Mongols. Land was divided up into non-hereditary fiefs. These fiefs were granted by the sultan to a lord known as pasha for various reasons (usually by distinguishing oneself in war or by giving providing gifts or women for his harem). The Ottomans dominated trade on the Silk Road and the Mediterranean. They formed a monopoly with Venice and traded with countries as diverse as Bavaria, Austria and Poland. Goods produced in the Ottoman Empire for which there was a demand in Europe included coffee from Yemen, sugar from Egypt, grain form Tunisia and Algeria, cotton from Palestine, silk from Lebanon, and textiles from Syria. The Ottoman and people within the empire were able to prosper simply because good were able to move relatively freely and safely in so large an area. A great deal of attention was devoted to making sure that grain, and other foodstuffs and supplies were delivered to Istanbul and they were made available at pirces the masses could afford. After 1405 the Silk Road between Europe and China was closed. The Ottoman Turks took control of the trade routes in the Middle East. Even news from China was in short supply. Within China, the emperors had closed their borders to foreigners. 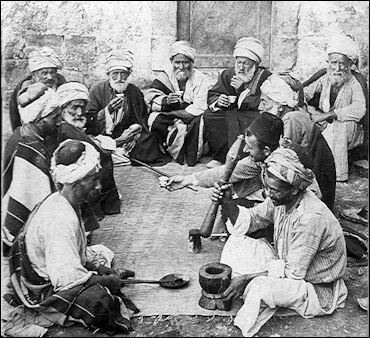 Enjoying coffee in Ottoman PalestineThe Ottoman empire took over the coffee trade when they took over Yemen. The oldest known coffee houses were opened in Constantinople in 1554 by two merchants. As well as places to hang out they were became known as "schools of the cultured." At this time Al-Makha (Mocha) in Yemen was the focal point of the coffee trade. Turkish coffee became so popular in Istanbul that women were allowed to divorce their husbands if they couldn't keep the ibrik , or pot, filled. Turkey never grew its own coffee, and the drink was popular only when the Ottoman empire was rich enough to import large quantities of beans. Turkish soldiers drank it as the besieged Vienna in 1683. The Ottomans in turn introduced coffee to Europe. Venetians merchants carried the first cargo of coffee from Turkey to Italy in the late 16th century. By 1618, the English and Dutch had set up coffee factories in Al-Makha (Mocha) in Yemen and made a killing when coffee houses became all the rage in the late 1600s.